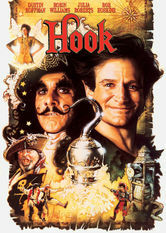 Hook (1991) on Netflix India. Check worldwide Netflix availability! If Hook isn't available in your country, or you are visiting a country where it isn't, there is still a way to watch it! Peter Pan, the boy who wasn't supposed to grow up, did just that. But vengeful Capt. Hook kidnaps Peter's kids, forcing him to return to Neverland. Peter Pan is all grown up and his magic is gone. Now his archenemy wants a rematch. Neverland never looked so good.